This Sunday 1 May 2016 is special. It doubles as Workers Day. 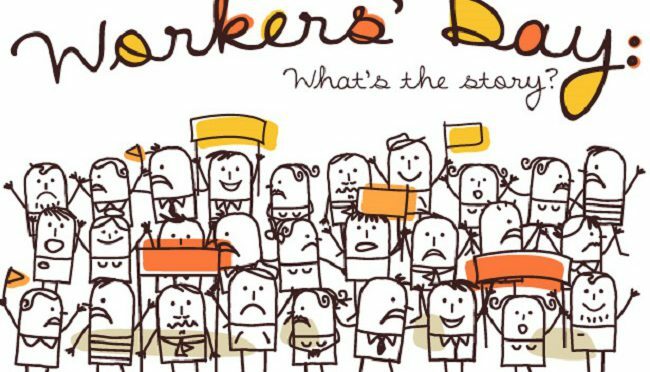 Sadly workers are faced with a gloom outlook that there is not much to celebrate this Worker’s Day Sunday. What is worse is that the International Labour Organisation (ILO) has told Workers to brace up for another bad year because the outlook for 2017 may be worse than 2016. Those who are lucky to be in employment are also facing uncertainty: job security level is low as permanent contracts are scarce. People are now having to work longer because pension ages are increased. Manual labourers are dropping dead on the workfloor because, afraid of calling in sick, workers who should be marching to their doctors’ consultations are hurrying instead to work. Informal arrangements are being made daily by the most vulnerable of workers who accept pay-cuts below minimum wage in other to remain in employment. Micro, Small and Medium Enterprises are squeezed so tight that those who manage to stay afloat of bankruptcy filling, have joined the league of the new working poor. Underemployment has become the new norm especially for the migrant workers. Medical Doctors trained in one part of the world, usually in countries with rogue leaders, would have to retrain for up to three years in other countries, usually countries with greedy paternalistic leaders, and still end up as auxiliary nurses. Teachers trained in developing economies are finding it even harder to find jobs as ‘cleaners on contract’ in schools where they are supposed to be teaching in the developed economies. There is nothing really to write home about Workers whose day it should have been today. I therefore decided to turn my Workers Day Sunday sermon to another ugly matter that has being trending in my native Nigeria in recent past: The Fulani Herdsmen. There is something about Nigeria and trending stories that beats imagination. There is no clean press anywhere in the world, I must admit, but Nigeria is a unique case. Except you don’t mind your fingers burnt badly, it is very important to verify every story out of the Nigerian media for reliability. Over the past weeks and worsening by the day, the media have being awash with stories of Fulani Cattle Herdsmen attacking and killing scores of people especially in the North-Eastern part of Nigeria while both State and Federal Governments appear unable or unwilling to confront the mayhem. The previous week, a think-tank of Nigerians in which I am a member, had put together a team under my prodding to verify the facts and come up with a position paper for the Presidency on activities of the Fulani Herdsmen. While that was ongoing, I had to go on air at Television Continental (TVC) to offer my periodic thoughts on the State of World Affairs, this time on Burundi one year after political crisis erupted there. Hell was nearly let loose amongst a minority of Nigerians who berated me for speaking about Burundi and not about my native Nigeria and indeed, Igboland where Fulani herdsmen were killing my ‘people’ in their hundreds. An isolated number of those who reacted to the TVC interview did so in good conscience and certainly meant well. Others were irrational and surely unfair, hiding perhaps under the latest crisis to subtly play their Igbo secessionist card. In my rather measured reactions, I always opened with a flat condemnation of the killings but refused to divulge that I was working on a reaction but first I needed to get the facts straight. I chose rather to ask whether it was being suggested that I turn down media invitation to offer thoughts on other parts of the world because Nigeria was on fire? In any case, while trying to get my head around what’s actually happening with the Fulani Herdsmen, more questions than recommended solutions have continued to play up in my head. For a start, some serious mayhem is confirmed to have been unleashed in parts of Igboland by a group alleged to be Fulani herdsmen. How sure can we be that these killers are indeed Fulani herdsman? Of course there are numerous terrorism theories out there but one that played up with added concern is: could it be that Boko Haram has infiltrated Igboland disguised as Fulani herdsmen? How come it took the President more than 24 hours to issue a statement on the matter? What about the State and Federal security apparatus? Why are they not being deployed to curb the menace? The scaremongers are also having a field day just as the conspiracy theorists are strategizing on the most efficient ways to wipe up sentiments on the back of the latest confusion and despicable killings. Some correlation has been made with 1804 with the emergence of the Fulani in the geographic space now called Nigeria, gaining dominance over the Hausas who hitherto occupied the space. They came not with smiles but with terror. At the time, the Fulani invaders as they were and still are called, showed no interest in negotiation but seized the lands after fierce battles. Some 20 years later, around 1823, the same ethnic group showed up in Ilorin ostensibly to assist the Are-ona-kakanfo, ruler of Ilorin, in revolt against his sovereign, Alafin Aole, the Alafin of Oyo. The ruler’s confidence was said to be gained and a strategic position was gained to facilitate his murder. Since then, till date, Ilorin has been under Fulani rule. A couple of years later, in 1825, Yorubaland was the focus of the Fulani conquerors as history told us. They were not pretentious of their desire to islamize the Yoruba Kingdom and Empire. If the fierce battle of Ibadan did not save the day, Yorubaland as we know it today would perhaps be an annex of the Fulani Empire. As these historical narratives dance around my head, I can’t help but wonder if these thoughts are helpful or destructive. Is it paranoia or are these handwritings on the wall for the Igbo’s to read and switch on the alert button? One thing is crystal clear in all of these: the case for a united Nigeria is not receiving any boost with these unfolding massacre of the Igbo man, woman and child in their sleep or in broad daylight. Have I given up hope in project Nigeria? Absolutely not but I am hopeless about the current crop of Nigerian leaders. They seem not to have any value for individual Nigerian life. They appear by their actions to be disconnected from the Nigerians that should have been their number one priority in the first place. They place no value on dialogue and are obviously permanently hunted by the prospect of disintegration of the country to the point that, for them, discussing national sovereignty is akin to break-up of Nigeria. The sooner it is realized that a purposeful dialogue is inevitable, the sooner Nigeria is saved from the impending disintegration with bloodshed. I hope I am wrong that the current ravage of the Fulani Herdsmen or whatever name they go by, is strongly indicative of a worsening threat to Nigeria’s unity.